Photo: Thomas M. Baldwin House, ca. 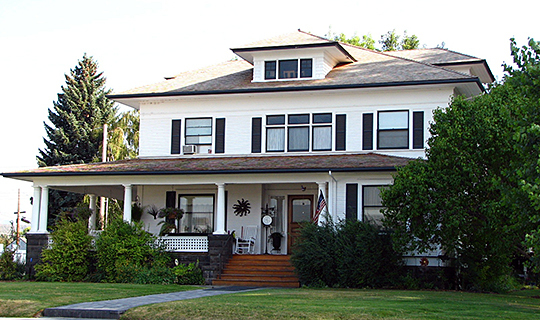 1907, 126 West First Street, Prineville, OR. Listed on the National Register of Historic Places in 1987. Photographed by User:Ian Poellet (own work), 2007, [cc-by-3.0 (creativecommons.org/licenses/by/3.0)], via Wikimedia Commons, accessed April, 2013. The Crook County Courthouse is located at 300 NE Third Street, Prineville, OR 97754; phone: 541-447-6553. Crook County History, Crook County History, arcweb.sos.state.or.us, accessed April, 2013.